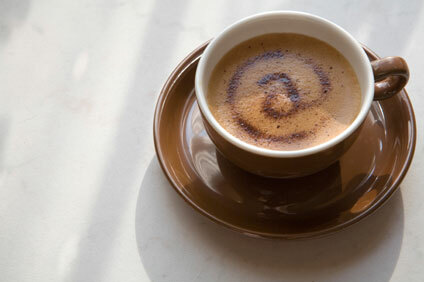 A cup of espresso is photographed on a white table. The espresso is in a rich, dark brown cup. The image of the "at" symbol is visible in the foam of the espresso, indicating that perhaps the person enjoying the cup of espresso is doing so while sending email correspondence. Rich, dark brown coffee beans are photographed in a small burlap sack on a white background. Before they can be enjoyed as a beverage, these coffee beans will be ground using special equipment. White crockery used for breakfast, including a pitcher, a creamer, and coffee cups, sit on a wooden folding table.